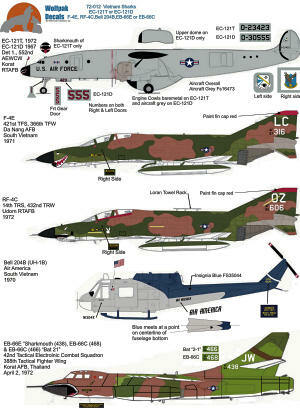 Just in time for the holidays, Wolfpack Decals has a nice sheet entitled 'Vietnam Sharks. All but one of the major airframe options has a sharkmouth on it, making this a most interesting sheet. There are a total of five airframe subjects with two having optional serial numbers and aircraft sub-types. So let us get started with the listing. First up is an EC-121T of the 552 AEWCW based at Korat. This is in overall ADC Grey with bare metal engine cowlings and a shark mouth. 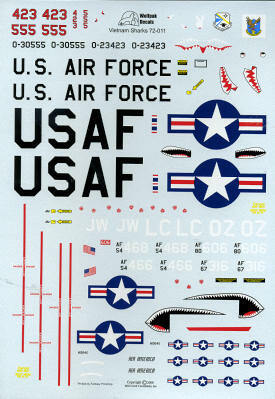 For those who wish to model the EC-121D, markings are available for that aircraft as well. The EC-121D does not have the upper radome and no shark mouth. Second an F-4E from the 421 TFS/366 TFW at Da Nang in 1971. Standard SEA camo with a red fin cap and the original gun muzzle. Next, a 14 TRS RF-4C from Udorn in 1972. It also has the standard SEA camouflage and a red fin cap. There is a bunny on the intake splitter as the canopy rails are red on this aircraft. The lone non-shark mouth is an AB-204B (UH-1B) of Air America. It is painted Insignia Blue and Silver. Finally, an EB-66E of the 42 TECS at Korat in 1972. Standard SEA camouflage. As a bonus, the markings for 2 EB-66C's including 'Bat 21' are on the sheet. An addendum slip is included as the printers forgot one of the serial numbers.